The location is very convenient. The value is great! Where to find Canandaigua hotels near an airport? Where can I find hotels in Canandaigua that are near tourist attractions? Visiting Rochester? 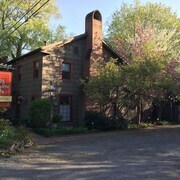 Looking to book a room within an easy drive from the downtown area of Canandaigua? Central Canandaigua offers 7 Expedia-listed accommodation options within a 0.1-kilometre (0.06-mile) distance. 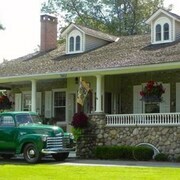 A great choice if you would like to stay near the downtown of Canandaigua, is the Chalet of Canandaigua. 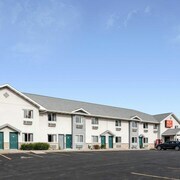 7 kilometres (4 miles) away from downtown Canandaigua is the Econo Lodge Inn & Suites Canandaigua. This is an excellent option for travelers seeking cheaper lodgings. 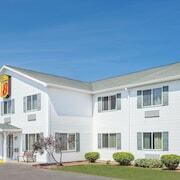 The Super 8 Canandaigua is another budget option in Canandaigua. 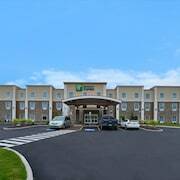 The The Del Monte Lodge Renaissance Rochester Hotel & Spa is 30 kilometres (20 miles) from downtown Canandaigua. Another hotel is the Chalet of Canandaigua, which can be found 0.6 kilometres (0.4 miles) away. You could also choose to book the Bristol Views Bed and Breakfast or the Onanda by the Lake. Like to go a bit further afield? Finger Lakes Region has a number of things to see. Lovers of the great outdoors will appreciate Finger Lakes Region's lakes. In addition, you should spend time at a few of the region's craft workshops. Locals and visitors alike in this part of United States of America commonly enjoy cross-country skiing. Looking for more things to do? Consider spending a day or two enjoying Water Street Music Hall and Rochester Contemporary Art Center, which you'll find in Downtown Rochester, 45 kilometres (27 miles) to the northwest of Canandaigua. Downtown Rochester hotels and accommodations include the The Strathallan- a DoubleTree by Hilton and Inn on Broadway. 18 kilometres (11 miles) to the northwest of Canandaigua, you can also stay at Victor, home to the Hampton Inn & Suites Rochester/Victor and Homewood Suites by Hilton Rochester Victor. The Eastview Mall and Valentown Museum are popular places to check out for those visiting Victor. Just because you are on vacation, doesn't mean you can't enjoy your obsession for sport. Carrier Dome can be found 100 kilometres (61 miles) to the east of Canandaigua. Those sports fans wanting to sleep near to the action can make a choice from the Sheraton Syracuse University Hotel & Conference Center or the Residence Inn Syracuse Downtown At Armory Square. Greater Rochester International Airport is located 45 kilometres (27 miles) away from Canandaigua. If you choose to stay close by, can book a room at the Fairfield Inn Marriott Rochester Airport or the Holiday Inn Hotel & Suites Rochester - Marketplace. 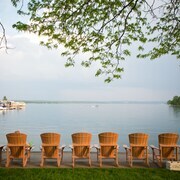 What are the most popular Canandaigua hotels? Overlooking Canandaigua Lake. Gorgeous Views! Only 150 Steps To Butler Beach!! Are there hotels in other cities near Canandaigua? 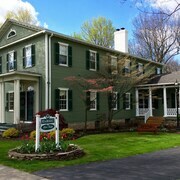 What other types of accommodations are available in Canandaigua? Explore Canandaigua with Expedia.ca’s Travel Guides to find the best flights, cars, holiday packages and more!